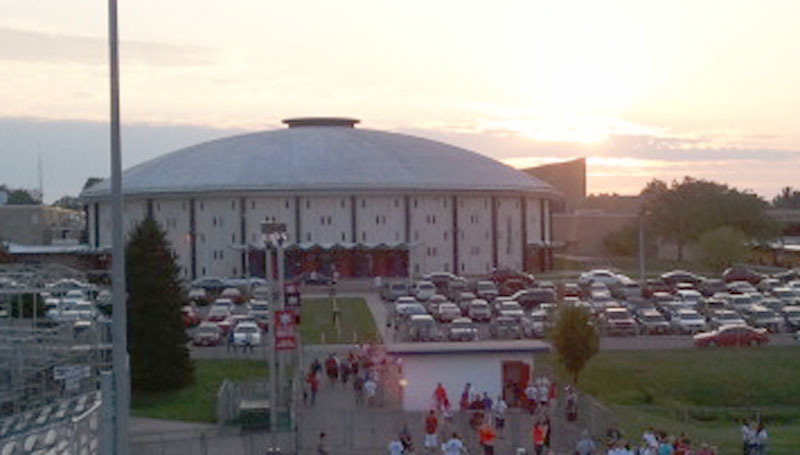 The Roundhouse at Marshalltown High School. Preliminary plans for renovation of the Roundhouse were presented to the School Board Monday night. Joe Benesh, from architectural firm RDG Planning and Design of Des Moines, presented two options: what he called the “base option” and the “everything included” option. The base option would include new bleachers, improved press box and observation areas, new second floor track, new roof, mechanical and electrical improvements and AV/sound/display/scoreboard upgrades. This project would also remodel the locker rooms, restrooms, laundry facilities and PE/equipment storage. Site improvements would include a new entry plaza, road re-configuration and decorative paving. The cost of this project would be $7.7 million. Benesh told the Board this work would improve the facilities to be a point of pride for the community. A second option, the “everything included” option, would also include a new music suite, new offices and a Hall of Pride, an auxiliary gymnasium, a new wrestling room, and additional site improvements and other work. It also includes the option for a new weight room. This project, which Benesh said was more a list of “wants” than “needs”, came in at $20.9 million. The Board will discuss the direction for the Roundhouse renovation at upcoming meetings in conjunction with revising the capital improvement plan. Board Member Larry Shrum noted that plans were still preliminary and whatever final project is approved, the work to fund the project would come from both the district and the community. Marshalltown Parks & Recreation department has assumed administration of the Bobcat Special Olympics program. Jennifer Hart, Parks & Rec supervisor, told the School Board the program is up and running, with the fall bowling season commencing this week. Parks & Rec has partnered with Marshalltown Schools for more than 40 years on a wide variety of programs, including Camp Marshalltown. Hart told the Board this partnership promises to continue offering the Special Olympics programs students have enjoyed and possibly expanding options later down the road. “We’re excited to be partnering with the school in another aspect,” Weir said. Hart says she has 65 students on her roster so far and many more potential future athletes. Anyone interested in signing up for Bobcat Special Olympics or those looking to volunteer can contact Jennifer Hart at Marshalltown Parks & Rec at 641-754-5715 or jhart@ci.marshalltown.ia.us or by visiting the office at 10 W. State Street (old library building). The Board accepted the substantial completion of three district projects Monday night. First was the demotion and site paving at the Support Services Building (old Anson Middle School). There were some change order costs with the project, but they fell within the contingency set at the outset of the work. The second was the MHS track resurfacing, which was completed without change orders. The third was the district security and surveillance project, which was funded through the Safe Schools/Healthy Students Initiative. During tonight’s presentation of design elements and cost estimates for the “Renovate the Roundhouse” project, it was obvious that a significant amount of work is necessary to return the Roundhouse to its former glory. The Board is committed to meeting this expectation in a fiscally responsible manner – which means also examining other facility needs and the district’s construction budget. During its Sept. 24 meeting, the Board will receive a comprehensive list of construction projects recommended for completion between 2013 and 2016. During the same meeting, the Board will receive information about how these projects could be funded – though no action will be taken on the Capital Improvement Project List or funding mechanisms until October. This evening Dr. Pecinovsky reported that for the first time in four years our students who took the ACT test last spring (137 juniors) scored higher than the state average in every category, scoring a full scale score point above the previous year’s test-takers. This was cause for rejoicing, and celebratory noises were made around the Board table when it was reported! I have since learned that MHS Principal Phomvisay made the same announcement at a football game on the Friday evening after the school first received the news—and there was essentially no response at all from the crowd. I live for the day when a crowd of MHS supporters will cheer as lustily for an academic achievement as they do for a touchdown! And I heartily encourage Mr. Phomvisay to continue making celebratory announcements about our students’ accomplishments whenever he has the opportunity. The community needs to know about our students’ successes, and we need to let our students know that we are proud of ALL of their accolades. First Reading: 204.6 Notice of Board Meetings, mark reviewed. 204.5/204.5-R Organizational Meeting/Procedures, changed to state Board Secretary calls meeting to order, waive second reading. Initial Review: 204.12 Minutes of Meetings-Publication of Proceedings, mark reviewed. 204.7 mark reviewed; 204.8 mark reviewed; 204.9/204.9-R Agenda and Order of Regular Business Meetings, mark reviewed. 204.10 Community Participation in Board Meetings, mark reviewed. 204.11 General Complaints by Citizens, add that complaints are addressed in policy 402.5, bring back for first reading.